Can 140 Characters or Less Really Impact IT and the Business? Ever since popular social services such as Facebook and Twitter started, the phrase Social Media has been one of the hottest buzz words in IT. Articles, presentations, opinions – you name it, it’ll say embrace Social Media, because if you’re not doing so already, you’re behind the times. But where exactly do the microblogging platforms, with Twitter being the most popular, fit when it comes to IT and business? This presentation will go in depth into the benefits of microblogging, as well as the downfalls, and whether it’s just a waste of time and resources. Michael Slabodnick is the Incident Coordinator at Nationwide Children’s Hospital and one of the key Service Management analysts for their Information Services Department. He has been working with technology for the past 10 years and recently achieved his ITIL V3 Expert accreditation. 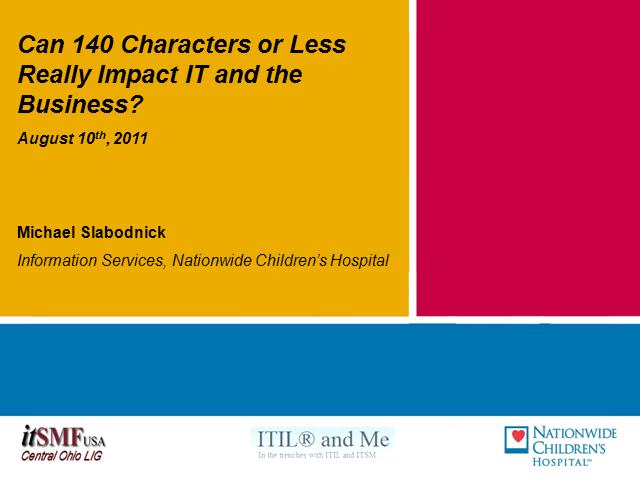 Title: Can 140 Characters or Less Really Impact IT and the Business?